Jeanne (Maria Schell) is a woman of aristocratic background who falls in love with and marries the handsome but impoverished Julien (Christian Marquand). After the marriage they settle down in her ancestral home but Julien soon becomes restless and begins an affair with the family maid Rosalie (Antonella Lualdi). When Gilberte gives birth to his child, Jeanne discovers the truth but forgives her husband. Some years later, by chance, Julien meets an old acquaintance from Paris. He finds himself irresistibly drawn to the man’s wife leading to another affair, this time with tragic repercussions. It's a cruel irony that Alexandre Astruc should have laid the theoretical foundation for the French New Wave with his 1948 essay “Le Camera Stylo” only to see his own career brushed aside by a younger generation inspired by it. Perhaps, if his own work as a filmmaker had been as radical as the article suggested it might be, he would have forged a career as celebrated as that of Alain Resnais or Agnes Varda. Instead he chose carefully crafted literary adaptations, the finest of which was almost certainly Une Vie adapted from the novel by Guy de Maupassant. It’s a work that, in the words of critic David Thomson, “justifies the man as surely as Night of the Hunter does Charles Laughton”, and, like that masterpiece, tells its harrowing tale in the most poetic of cinematic imagery. Guy de Maupassant was already a literary star, famous for his short stories, when he published his first novel Une Vie ou L’Humble Verite in 1883. Like much of Maupassant’s work, the book expresses an essentially pessimistic view of human nature in which suffering and disillusionment are the inevitable consequence for those who refuse to face the reality of human behaviour. Over the course of the story Jeanne endures one misfortune after another until all that is left of her romantic illusions are hopelessness and despair. In adapting the novel with the help of co-writer Roland Laudenbach, Astruc cut much of the extraneous content and characters, including a lengthy final section devoted to the downfall of Jeanne’s son Paul, and focused on the central relationship between Julien and Jeanne. He later recalled, “I didn’t choose the subject. The film was offered to me on the condition that Maria Schell was the lead. I re-read the novel and felt I could do it. For Maupassant, Une Vie was the story of an unhappily married woman who couldn’t obtain a divorce because divorce then was impossible. 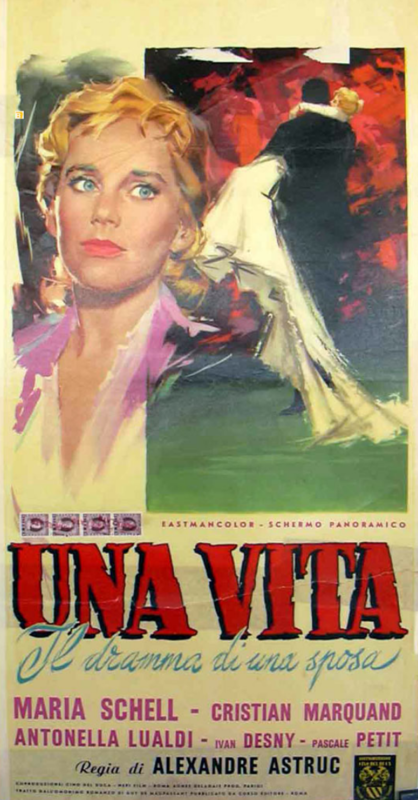 I insisted on what was still relevant to it: the difficulty of two people living together.” This is still the film’s main draw, not least because Maria Schell, then one of the biggest actresses in European cinema, and Christian Marquand, the heart-throb star of And God Created Woman (1956), commit to their roles with rare intensity. Schell’s limpid blue eyes, in particular, are a mesmeric lodestar of emotional ferment at the film’s centre. Stylistically Maupassant belonged to the naturalist school and his writing is marked by its quality of authorial detachment. Astruc's direction reflects this, yet his orchestration of elements lends the film a romantic sweep that works wholly in its favour. Key amongst his collaborators are cinematographer Claude Renoir who channels the picturesque impressionism of his grandfather, the painter Auguste, capturing the Norman countryside in vivid painterly colours; and composer Roman Vlad whose musical score conveys a sense of grandeur in keeping with the film’s tragic theme. Of course, like Astruc, Godard revered such American auteurs as Orson Welles, and no doubt he recognized their influence on the film. Indeed, in Une Vie, we can see, perhaps, the kind of cinema the later directors of the French New Wave might have produced had they attempted to simply imitate the work of the directors they most admired rather than radically reinventing the form. As it was, Astruc’s film was overshadowed in 1958 by the debut features of Louis Malle (Elevator to the Gallows), Claude Chabrol (Le Beau Serge) and others. Seen today, Une Vie can be appreciated as a remarkable work of period drama, certainly underappreciated and worthy of rediscovery.